Almost every kiddy-lit bookshelf this side of the pond will have The Gruffalo gracing its shelves. It’s a beloved bedtime story for little ones, and a memory-maker for mums and dads of when our children still snuggled close to hear us speak. This year marks the 20th year since its creation, and to celebrate, the Royal Mint is issuing a collectable Gruffalo 50p coin. Julia Donaldson’s famous book, first published in 1999, and selling over 13 million copies, has been reincarnated many a time, from West End productions to dinner plates and underpants. Now, a commemorative coin, featuring Axel Sheffler’s famous illustration, has been made available for fans of the little brown mouse’s burly-but-endearing nemesis. 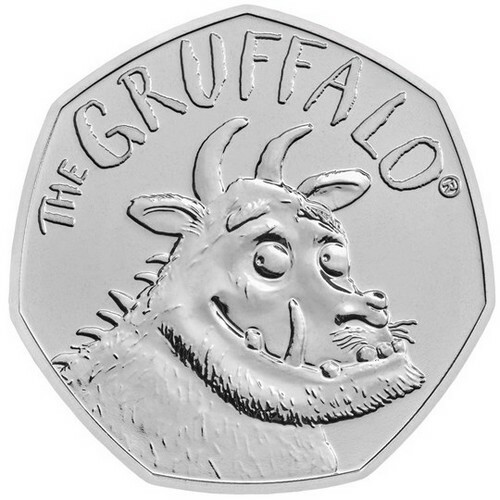 With its official release this February, the Royal Mint has already confirmed the stock of gold proof and silver proof special edition coins as all fully reserved, so it’s best to make haste if you want to make one of the final few standard silver Gruffalo 50p coins yours. Now all we need is the rest of the gang to complete the collection—Owl, Fox, Snake, and of course, wily lil’ Mouse. For more info on the ultimate birthday, christening, or just-for-fun gift, see here—quick. Everything Suddenly a Bit Whiffy? You Could be PregnantWhy Does My Cat Want to Sleep Close to My Baby?